I should have shared this post on National Pi Day, but I didn’t get it together in time for that. Maybe next year I will have a pi/pie related story prepared for March 14. In the meantime, enjoy this pie related story today. NOLAgirl and I starting making plans to attend pie night a month before it happened. She was in Phoenix, and I was house and cat sitting in Murphys, CA. She must have mentioned pie night to me, and I was all in! Pie. Pie is delicious. I love pie. Practical Art is a friendly retail and gallery space featuring 100% locally-made wares in wood, fiber, ceramic, glass, metal, and up-cycled materials. 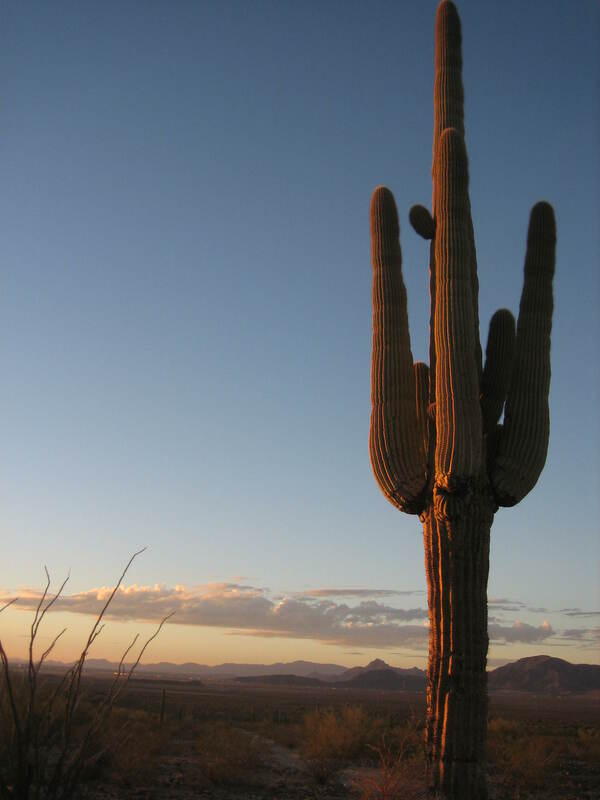 All of our work is produced by Arizona artisans—we have over 100 of them producing work for you. We carry art that is practical in some way—everything from kitchen tools to home and office items, soap, clothing, furniture, jewelry, and more. Pie night is more accurately Charity Pie Night. The Charity Pie Night page on the Practical Art website says the monthly event has raised over $34,000 since 2011. Past beneficiaries of charity pie nights include Phoenix Art Museum, Phoenix Center for the Arts, Area Agency on Aging, Florence Immigrant & Refugee Rights Project, Rising Youth Theatre, and the Animal Defense League of Arizona. 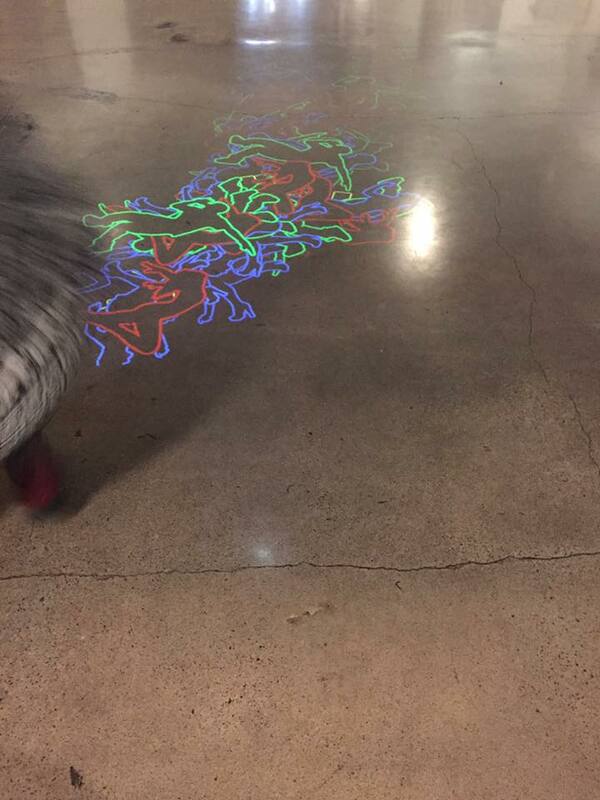 The night in December when NOLAgirl and I attended, the beneficiary was the Art Resource Center. The Art Resource Center is a non-profit corporation 501(C)(3) whose objectives are to collect reusable discards from individuals and industries and offer them free of charge to schools and other non-profit entities for the purpose of making art. By recycling art worthy materials for creative minds, THE ARC is filling the ever widening funding gap of nonprofits by providing quality materials to continue the passion we call ART. The Art Resource Center is a wonderful project that I can get behind 100%. However, on that December night, my prime objective was PIE! Here’s how it worked: $5 got a person a slice of pie; $10 got a person unlimited slices. Anyone who knows me (and my love of pie and love of a bargain) will not be surprised to find out I had budgeted $10 for all the pie I could eat. NOLAgirl and I lined up and waited our turn to step up to the pie table. Vonceil’s Pies is my dream in the making…some day I hope that Vonceil’s will be my own store front bakery in which I can share the wonderful, crazy, beautiful world of homemade pie to the Arizona community. There must have been a dozen different pies on the table, and they were being served up by friendly young women wearing cute aprons. There were vegan pies made with no animal products. There were traditional pies made with whatever traditional pies are made of. 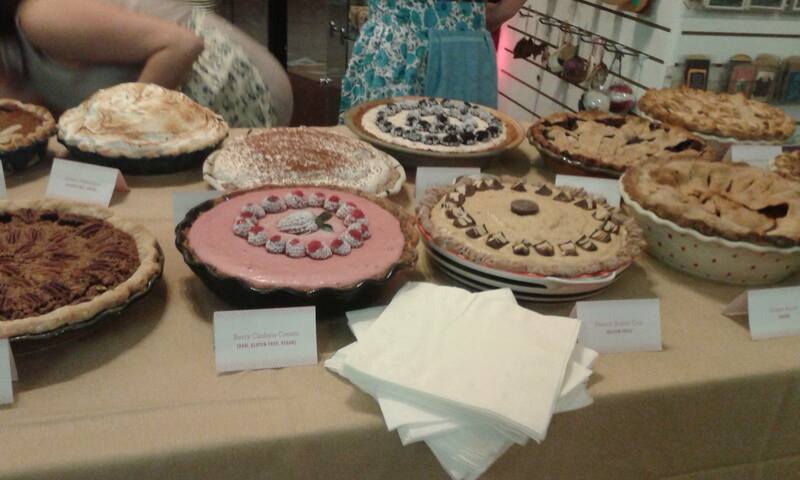 There were berry pies and fruit pies. 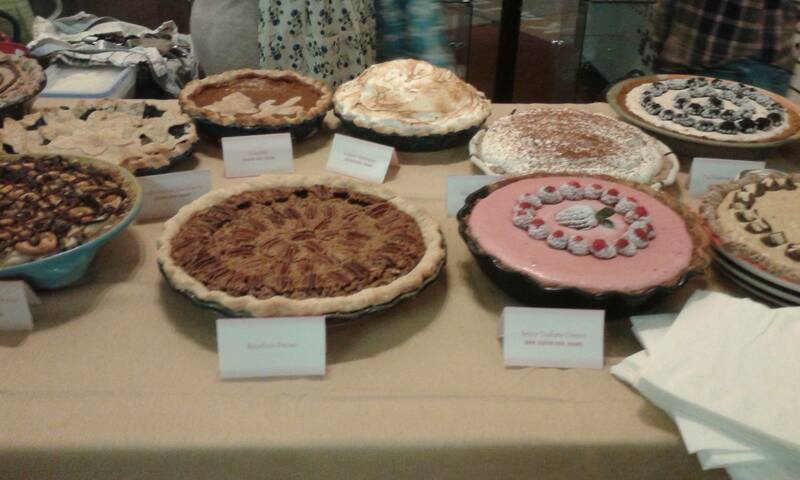 There were pies containing chocolate and pies containing chocolate and peanut butter and pies containing alcohol. One of the pies had a crust made from crushed nuts, which made it gluten free. How would we ever decide what varieties to choose? It seemed like bad form to say Give me one of each! and besides, I don’t think I could have fit a dozen slices of pie on my medium-sized plate. NOLAgirl and I each chose four flavors to sample, then went and found a place to sit in the back of the store. Wow! That pie was good. I wish I had noted which flavors I tried, but alas, I did not. In any case, every type of pie I tried was delicious. After we finished our first round of slices, NOLAgirl and I walked around the store and looked at all the cool items for sale. In “The Big Robot Show” local mixed-media artist, Jordan-Alexander Thomas exhibits his inventive and sometimes curiously odd robots and sci-fi creations on a grand scale. Using wood and up-cycled found objects, Thomas transforms these findings into whimsical and entertaining creations that are constructed to excite the imagination. Thomas began creating robot sculptures when his passion for indie handmade objects collided with his love of all things science fiction. The robot and sci-fi creations were wonderful! I loved them but didn’t take any photos. Luckily, you can see some of them on them on Thomas’ website. Really, it’s worth clicking on the link and having a look! After we looked at everything in the store, NOLAgirl and I shyly asked one another if we wanted more pie. As a matter of fact we did, thank you very much. We got back in line and patiently waited to get up to the pie table. The pies were dwindling by this point, but we were both able to get slices of four pie varieties we hadn’t tried in the first round. They too were divine. Once we finished our second helpings of pie, our bellies were full, and we were all sugared up. It wasn’t an entirely unpleasant feeling, but maybe I don’t need to eat eight pieces (even eight small pieces) of pie in one night. 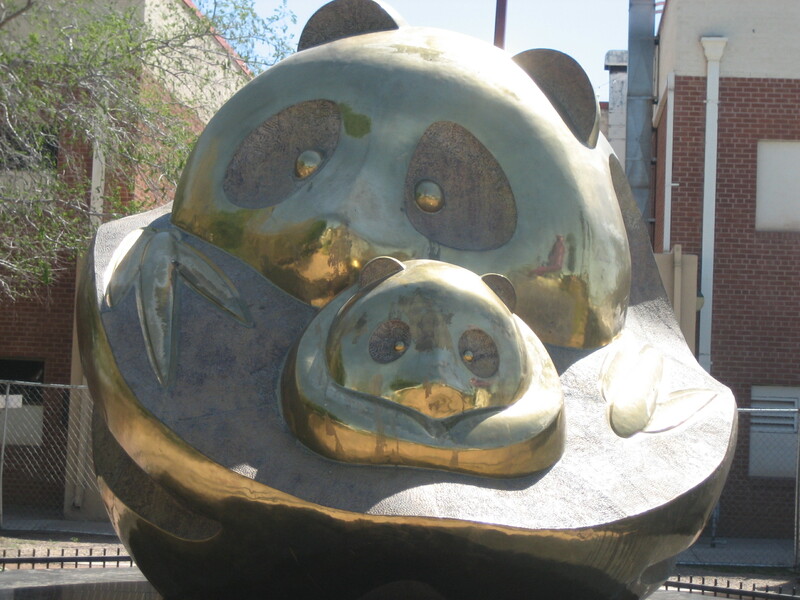 For folks visiting Phoenix, I highly recommend a stop at Practical Art. For folks who like pie, if you can time it right, you really should make your visit there coincide with Charity Pie Night. 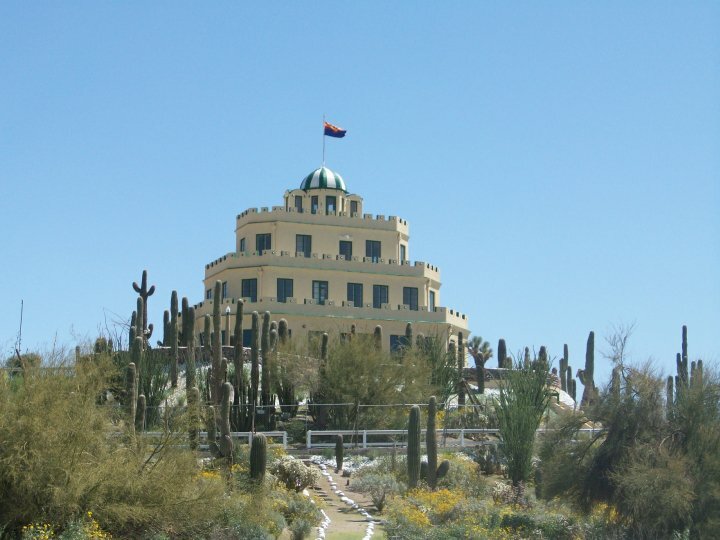 Today’s guest post was written by an old friend of mine who currently lives in Phoenix, Arizona. It’s November 1st and finally, I believe the summer has left us. Don’t get me wrong. We will still have days with temperatures in the 80s but the evenings and the mornings are so cool and comfortable and finally wearing long pants is an acceptable dress code. This summer has been especially hard on this perimenopausal woman in her late 40s. The temperatures have been no higher than other years and the fact that the hundred degrees last until October is normal. But my ability to cope with the warm temperatures is not what it was 20 years ago. 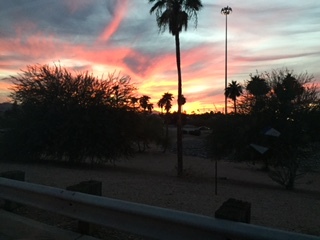 When I moved to Phoenix, many friends asked “Why Phoenix?” “What’s in Phoenix?” And honestly for years I had no answer for them. It’s flat, it’s brown and it’s very new and modern compared to other cities in the United States. The history here only goes back to the 1940s. Convincing the city council that we need to keep those buildings from the 40s and 50s has been a challenge. Hence why everything is so new and modern. So when I find a building that is unique/different/older I get super excited and I must go inside and explore! That’s the case with the Tovrea Castle. The Ellis Shakelford House. The Security Building downtown. Luhrs Tower. sunrise every morning and night that can take your breath away. Sonoran hotdogs. 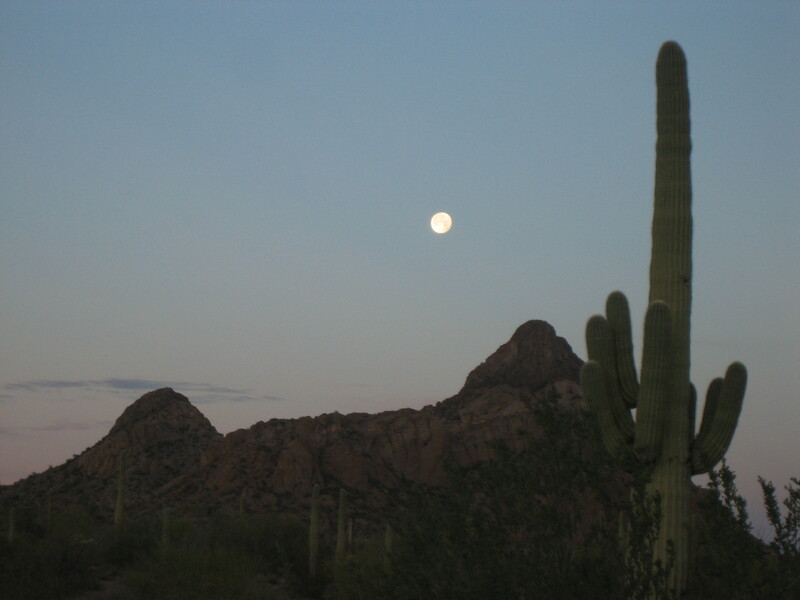 The Superstition Mountains. Home of Miranda Rights. 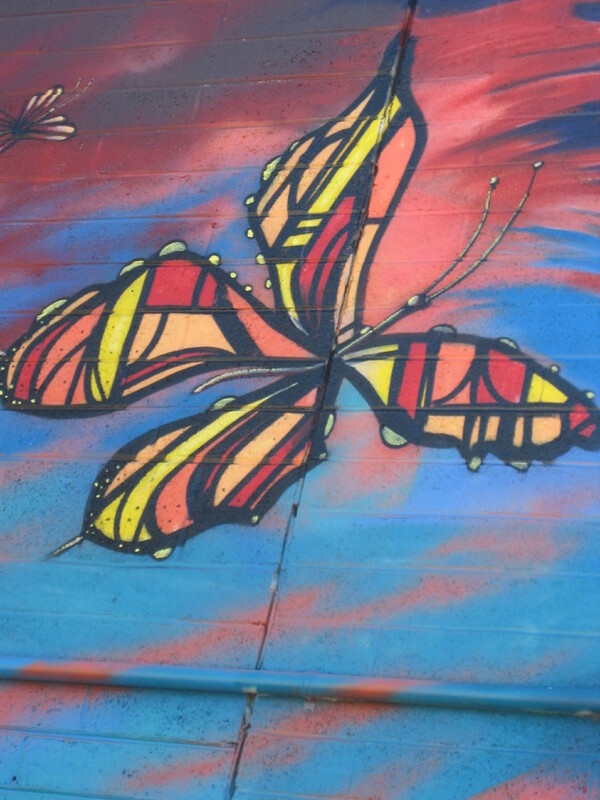 Witnessing the evolution of a grass roots art and historic preservation community. My family. My community. 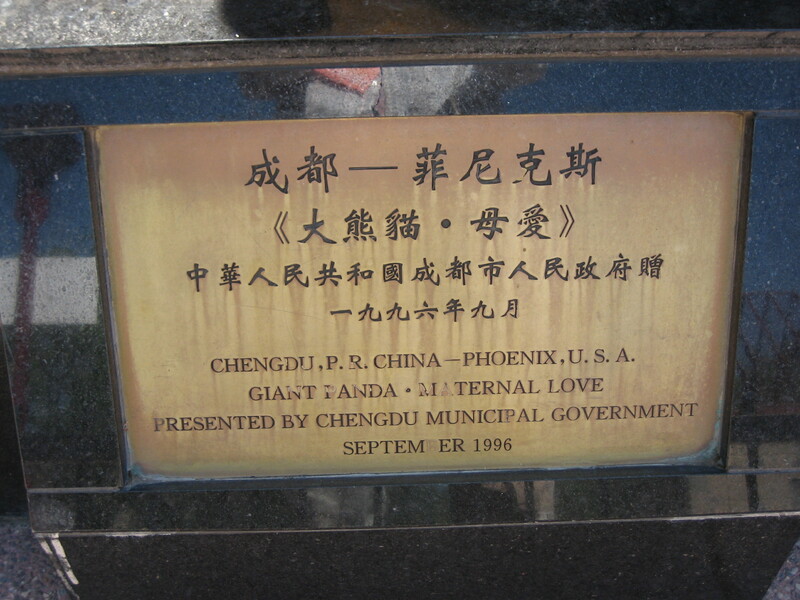 The photos were taken by the author. 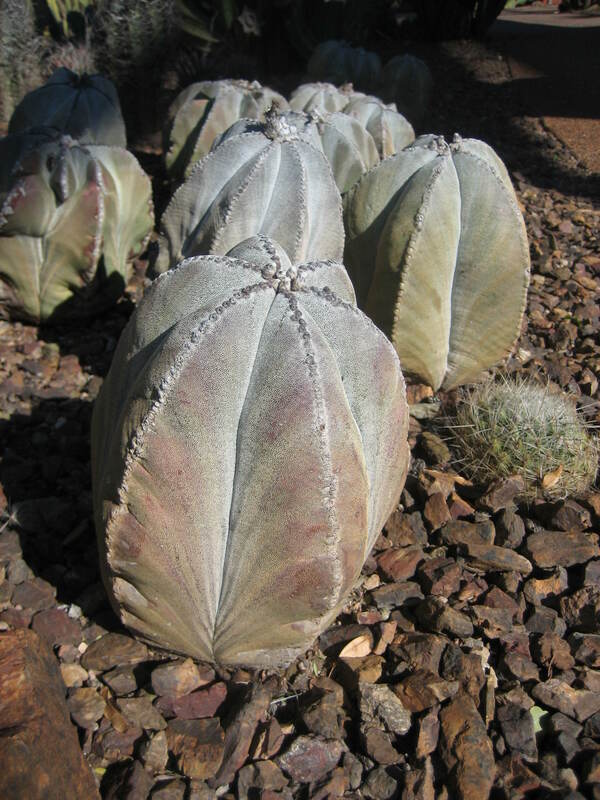 …It focuses on plants adapted to desert conditions, including an Australian collection, a Baja California collection and a South American collection. 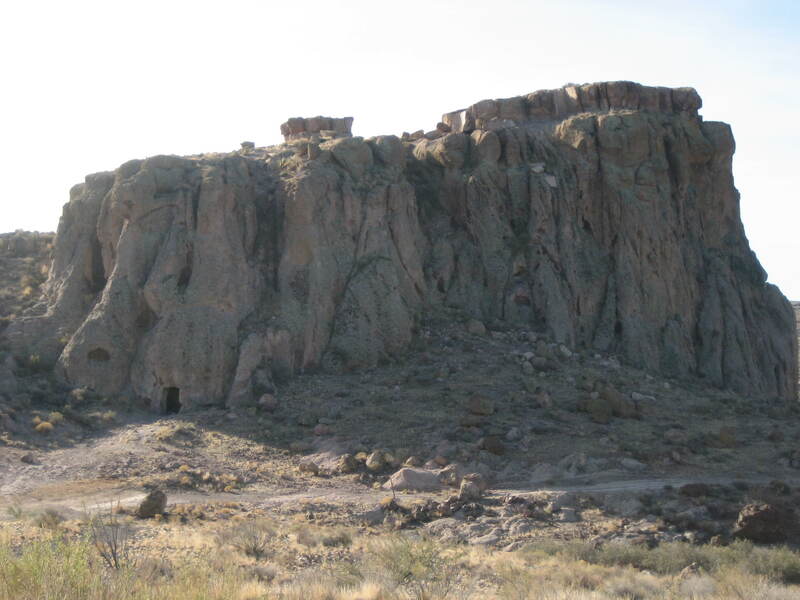 Several ecosystems are represented: a mesquite bosque, semidesert grassland, and upland chaparral. 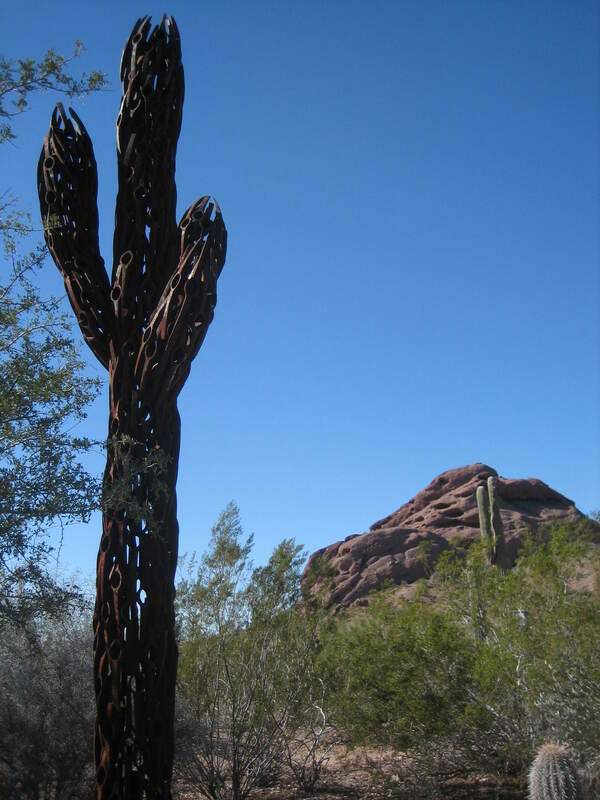 This 20 foot tall saguaro sculpture on display at the Desert Botanical Garden was created by Jeff Hebets in honor of his cousin, Phil. 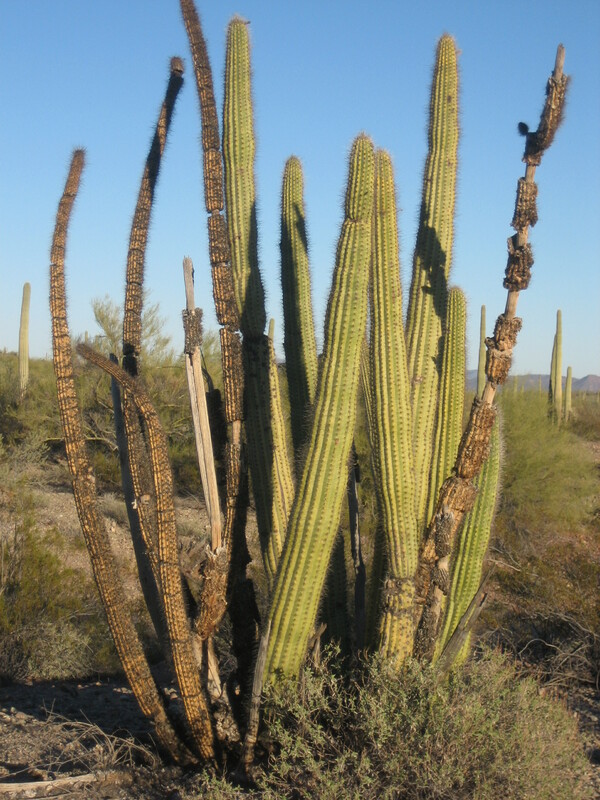 The saguaro is made from pick heads used to salvage native plants. 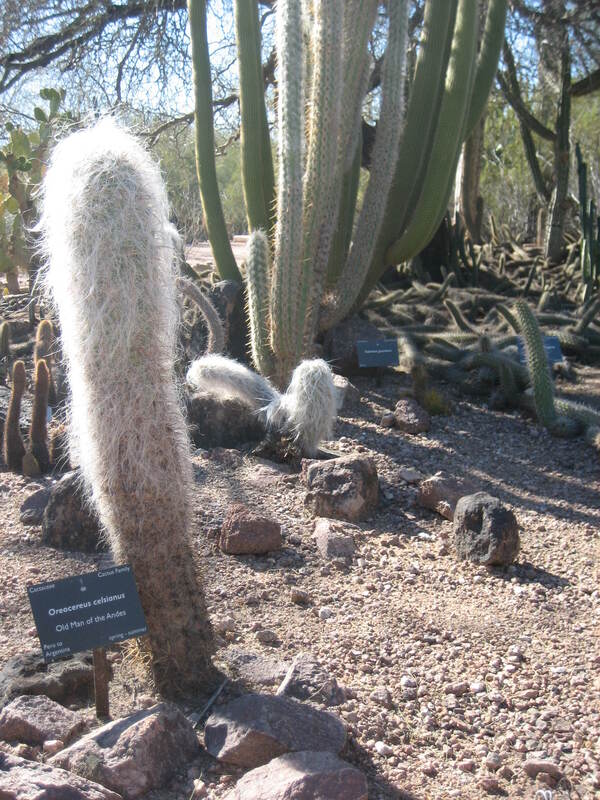 Admission to the Desert Botanical Garden is a bit pricey: $22 for adults 18-59, with only a $2 discount to seniors. I am fortunate to have a friend with a membership to the Garden. Not only does she get in for free, but one guest can get in for free with her. My friend treated me to a morning in the Garden. 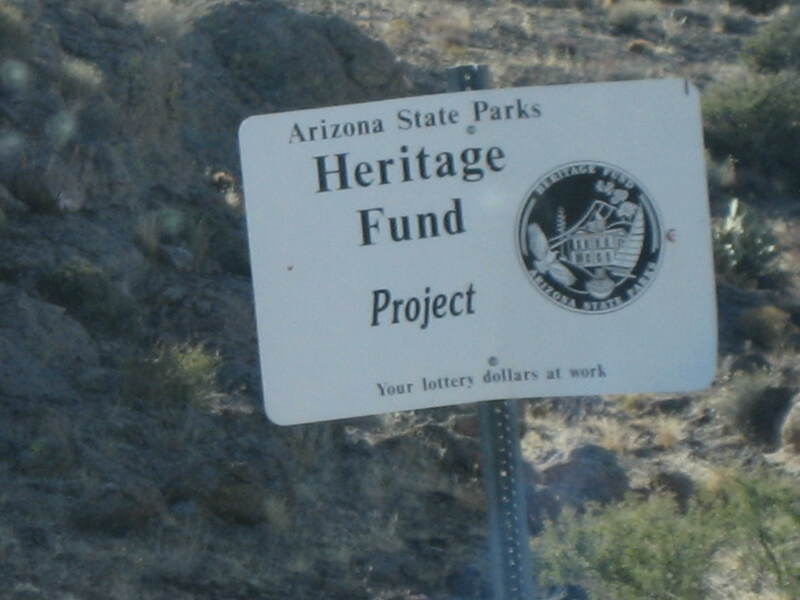 There are five trails in the Garden: the Desert Discovery Loop Trail, the Plants & People of the Sonoran Desert Loop Trail, the Sonoran Desert Nature Loop Trail, the Center for Desert Living Trail, and the Harriet K. Maxwell Desert Wildflower Loop Trail. My friend and I were only at the Botanical Garden for a couple of hours, so by no means did we see it all. My favorite part of the visit was seeing cacti that were new to me, ones that I hadn’t already seen hundreds of times in far south Arizona. 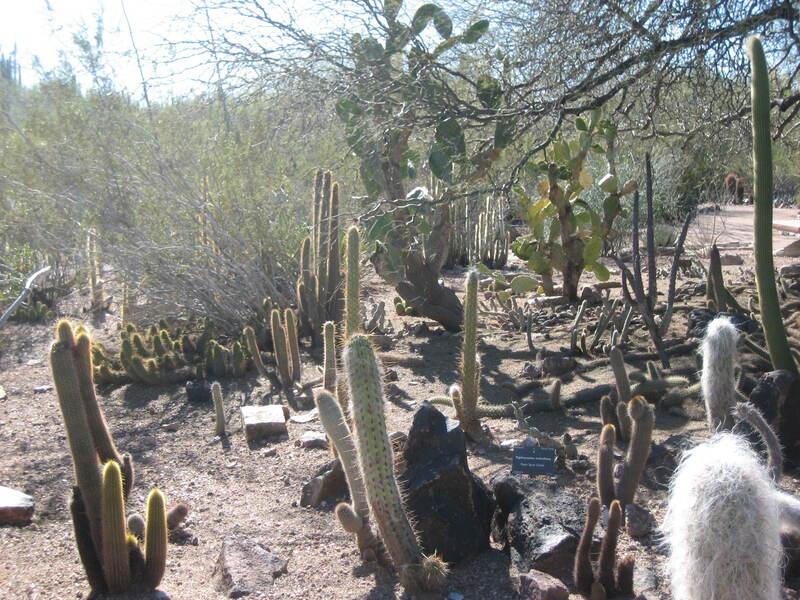 The cactus on the far left of this photo is an old man of the Andes (scientific name: Oreocereus celsianus). Oreocereus celsianus, or the “old man of the mountain” is a member of the family Cactaceae native to the high lands of the Andes in South America, and is named for its fluffy white hair, which may protect it from intense sunlight and extreme temperatures. Old Man of the Andes is a striking cylindrical cactus due to its coat of dirty blond coarse hairs that covers its entire length. These hairs help protect and shade its green skin from both intense high altitude sunlight and the occasional cold snap. The species is native to Bolivia, Peru and northern Argentina where it is found on rocky cliffs at high elevations of the Andes and other mountain ranges. 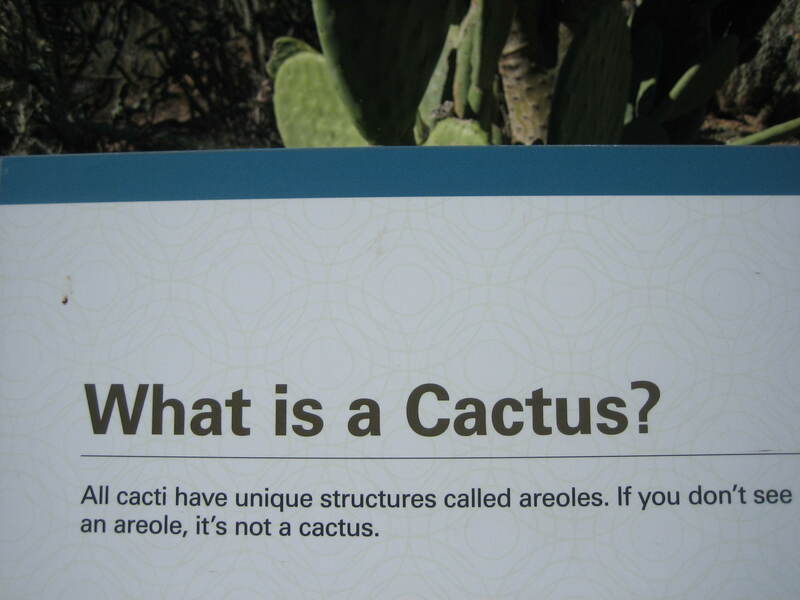 This cactus is well armed. 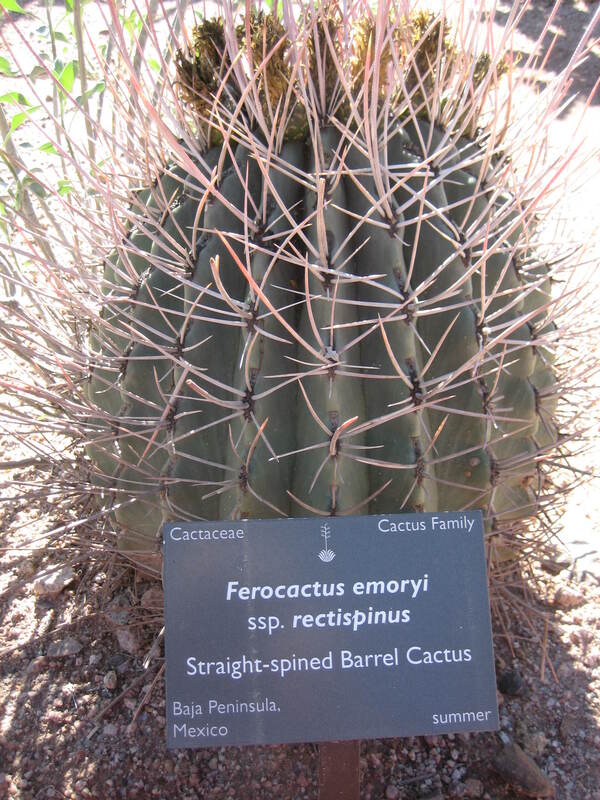 Spines are stout, thick, and dirty yellow to reddish brown in color. They occur in groups from one to four heavier spines surrounded by 7 to 9 very sharp radial spines. These sit nestled deeply into the hairy cloak. No hugs for you, Old Man! 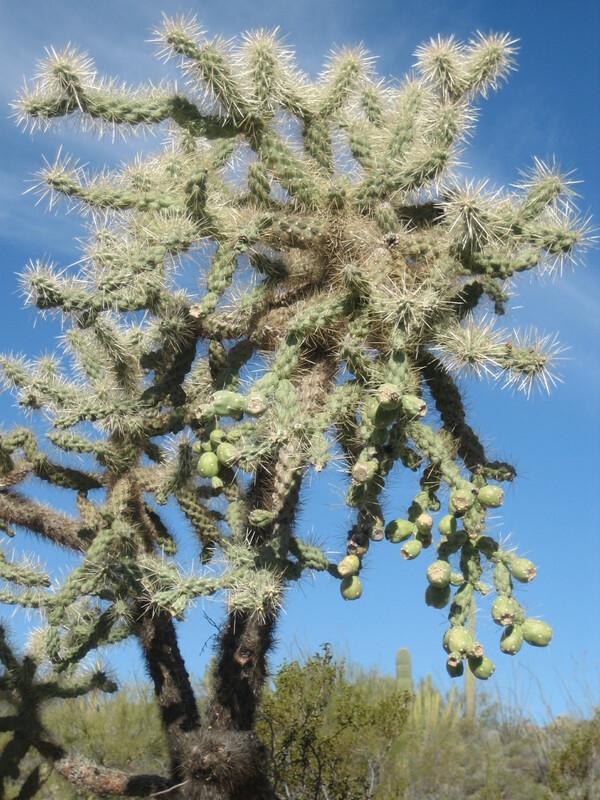 Another new variety I saw was the Bishop’s Hat (scientific name: Astrophytum myriostigma). This cactus looks as if it were made from cloth! 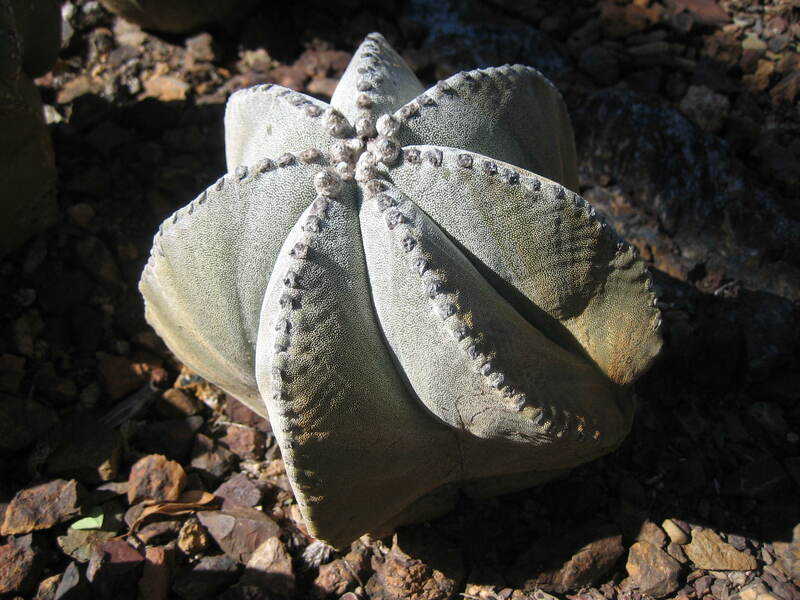 This photo shows a Bishop’s Hat cactus (scientific name: Astrophytum myriostigma). 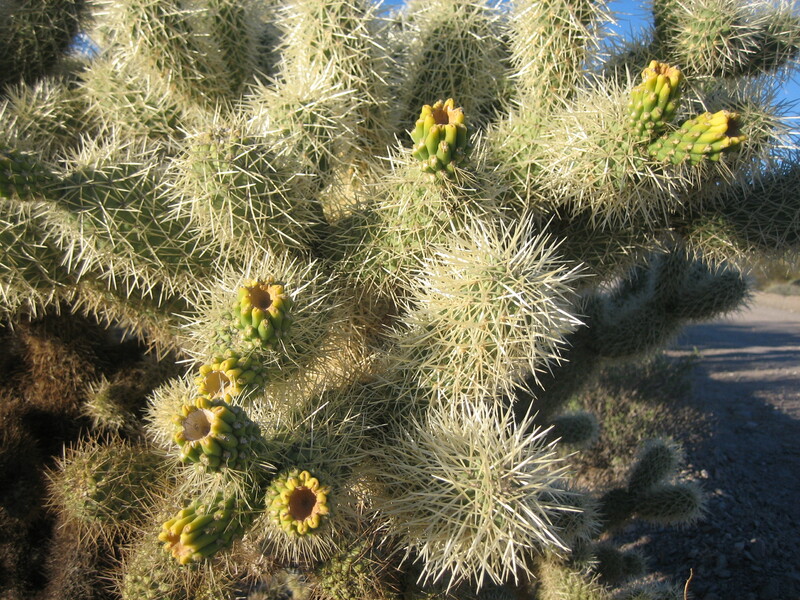 The basically green stem has no spine but is covered with tiny tufts of silvery hair (appearing like scales or spots). These give the plant a greyish cast. 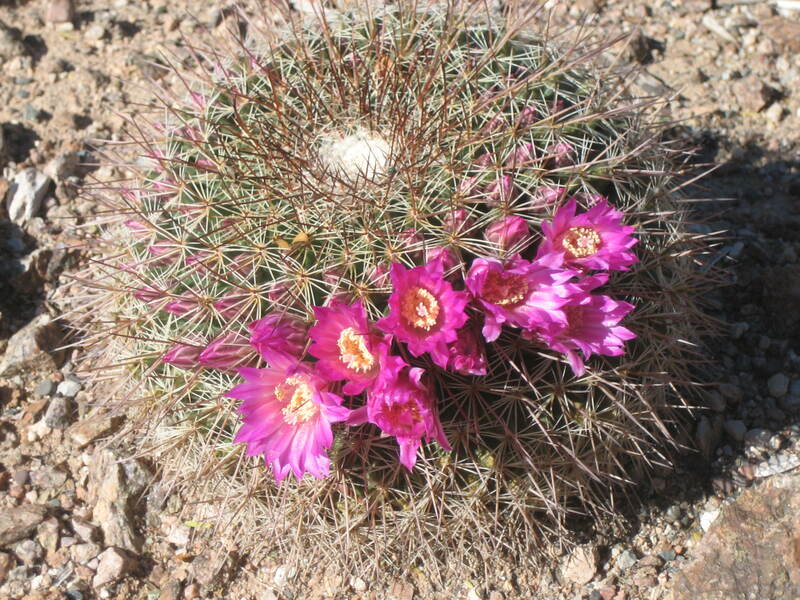 It wasn’t quite spring when I went on this visit, so there weren’t many cacti in bloom. The few early bloomers I did see were quite lovely. I bet hummingbirds are attracted to these vivid purple flowers. I had a nice time at the Desert Botanical Garden. Since my friend and I went early in the day, we didn’t have to fight any crowds. Thankfully, there were no groups of screaming school kids. Being near these various plants seemed very tranquil to me. However, as I write this post, I realize I didn’t take nearly enough photos. 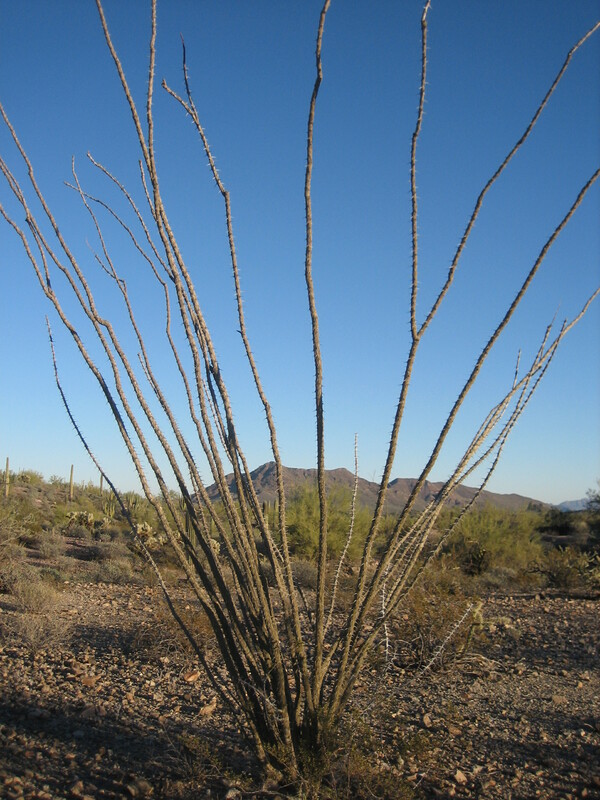 (What about the boojum trees? 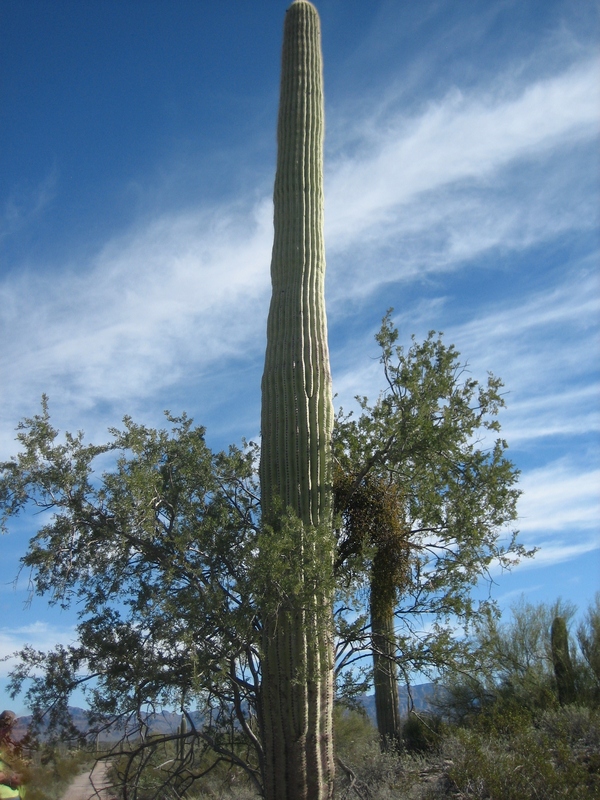 Why didn’t I get any pictures of the boojum trees?) Maybe my friend will treat me to another visit. 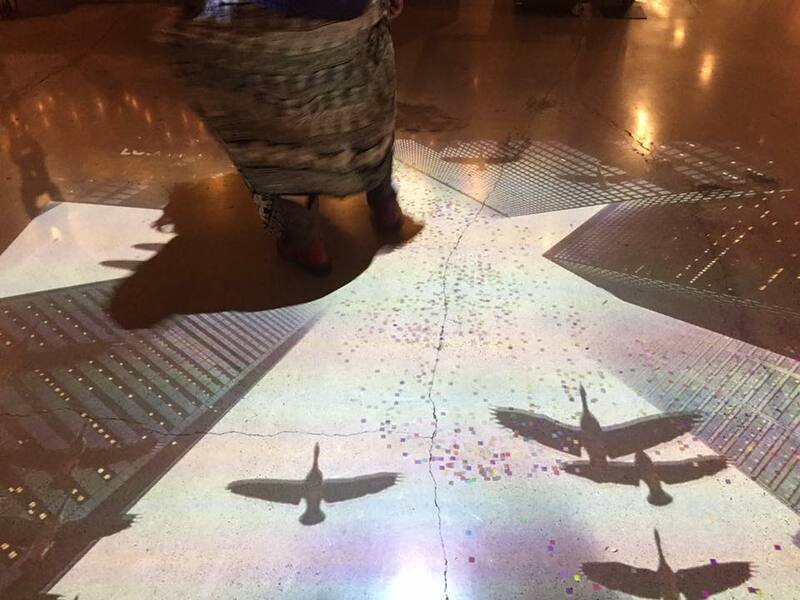 I took all of the photographs in this post. I was going to sell jewelry and shiny rocks in a parking lot craft market near Roosevelt Row during First Friday. 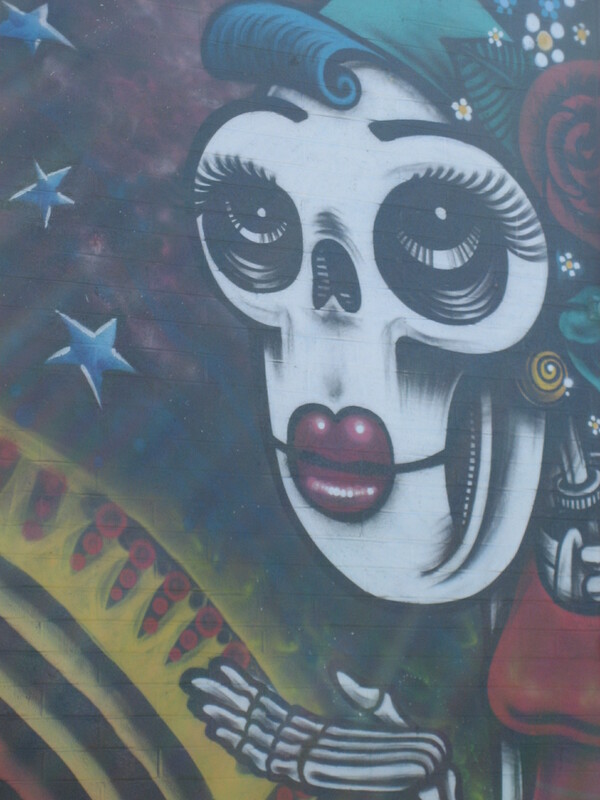 I arrived early, so I walked around a bit and took some photos of the murals painted in the area. 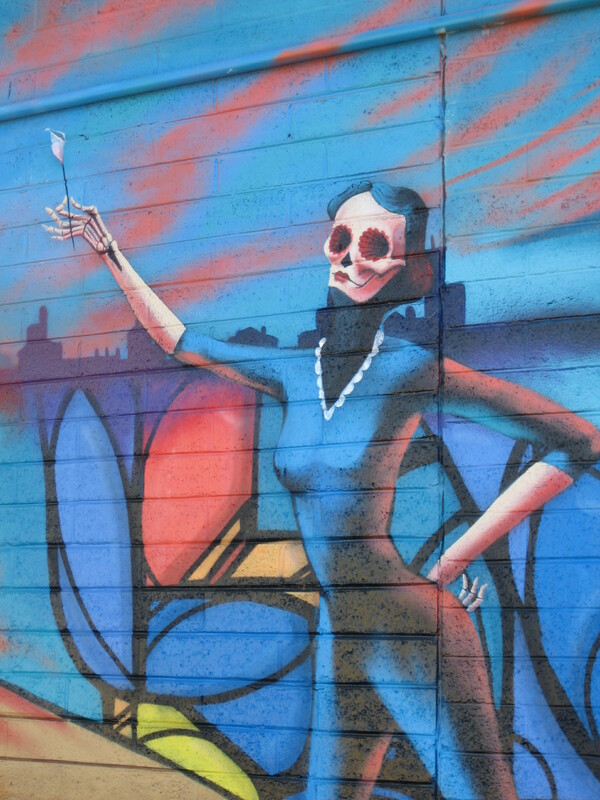 This mural is on the wall of a very small parking area. If a car had been parked in this spot, I’d have never seen this mural, much less gotten a photo of it. The paintings in the next several photos are on a building on 4th Street, almost on the corner of Roosevelt. 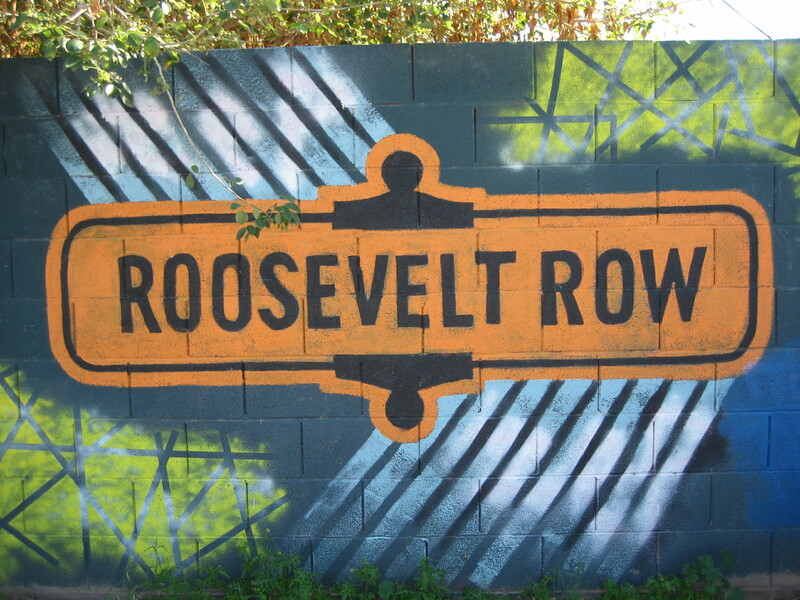 The actual corner of 4th Street and Roosevelt is a vacant lot, so this mural is visible from Roosevelt Street. This is about one-third of the full mural. 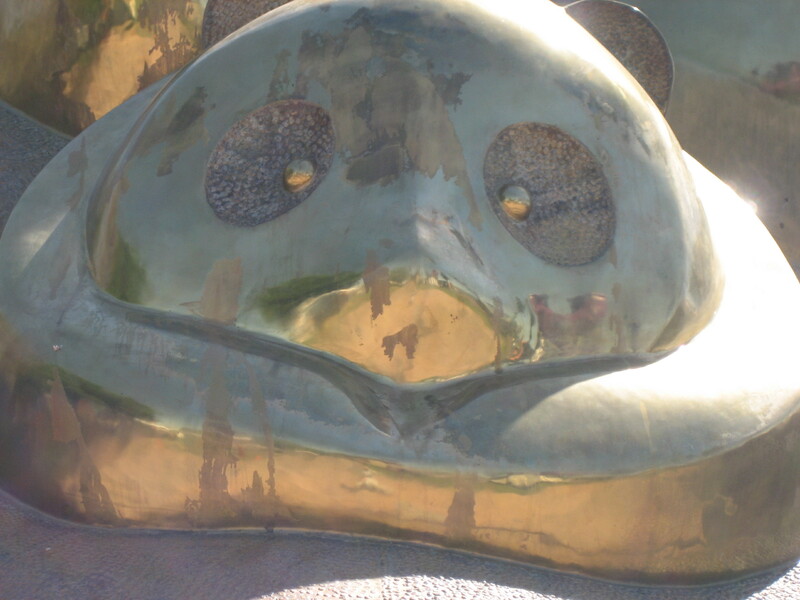 This is a detail of the detail. I really like the Day of the Dead-meets-flapper look, although I’m not sure how a skull could possibly have lips and eyelashes. And how could a skull have eyeballs? 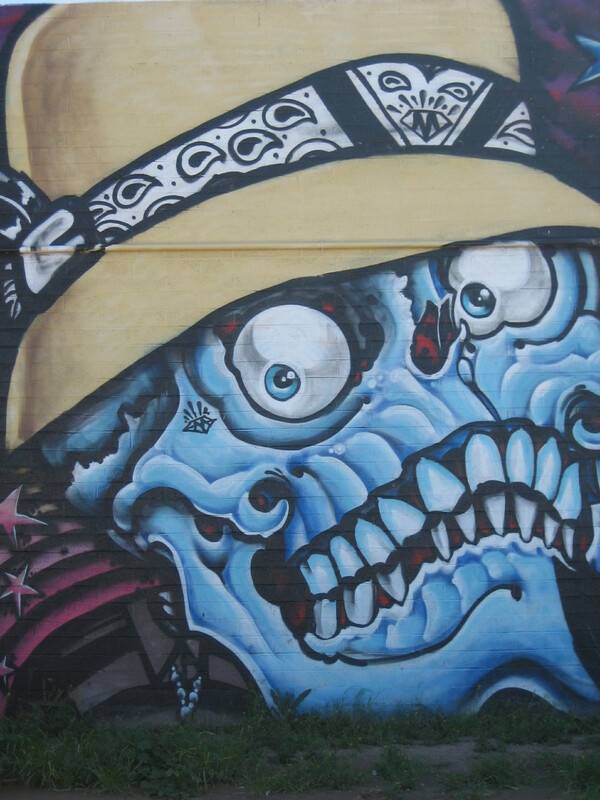 I do like this dapper skull guy. 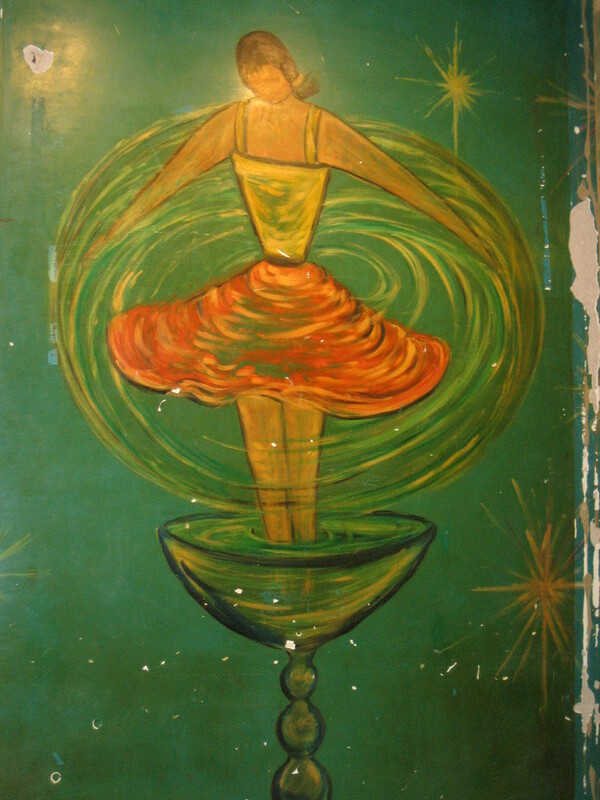 The other two thirds of the mural has a different vibe, more ethereal and dreamy. 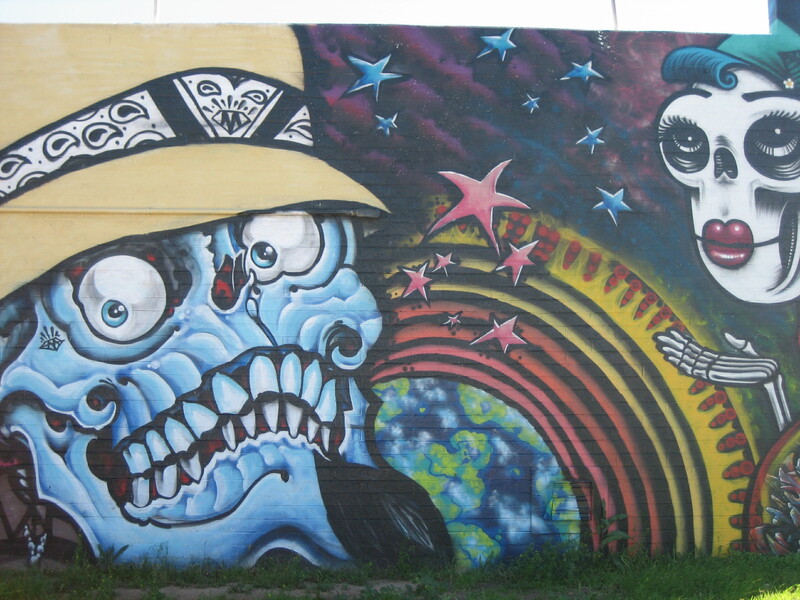 This portion of the mural is also by Tato Caraveo. 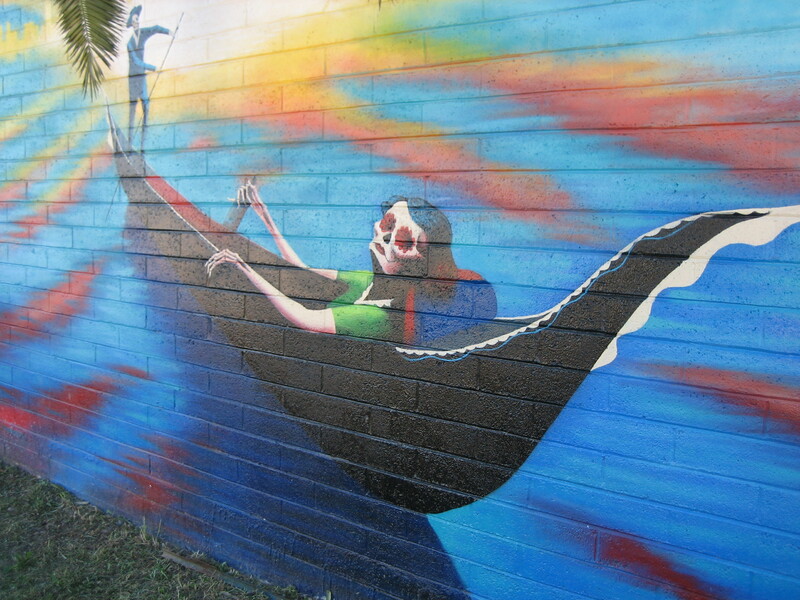 To see him working on it, go to http://www.thelostleaf.org/Murals.aspx and scroll down. 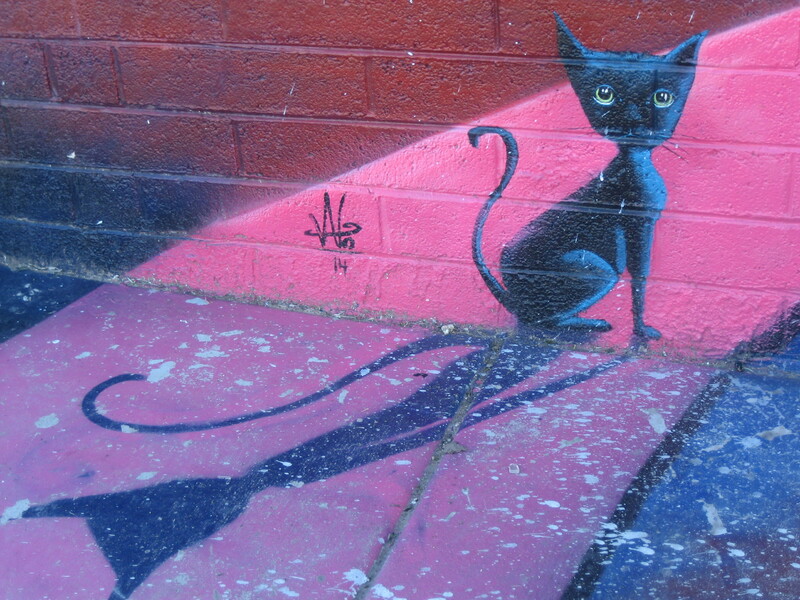 I especially like this cat and its shadow. The next piece has more of a graffiti vibe to it. It was painted just under the rafters of what seems to be an abandoned house. 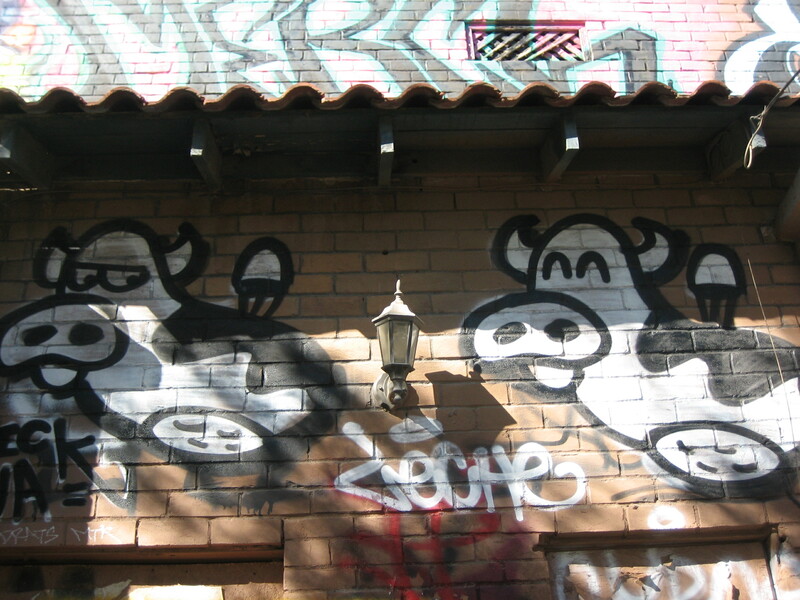 I believe I took this photo of cow graffiti between 4th and 5th Streets on Garfield, but maybe it was between 5th and 6th Streets…definitely on Garfield though. 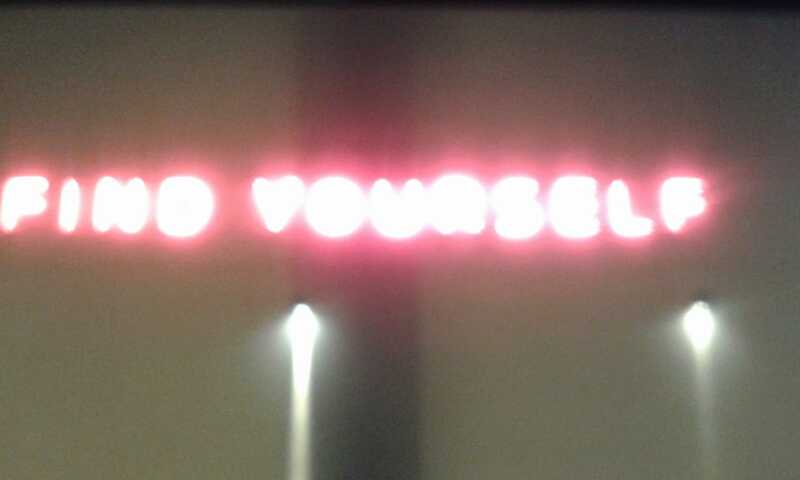 The last piece is at 3rd Street and Roosevelt, and I took the photo the next afternoon when I was out and about with Nolagirl. 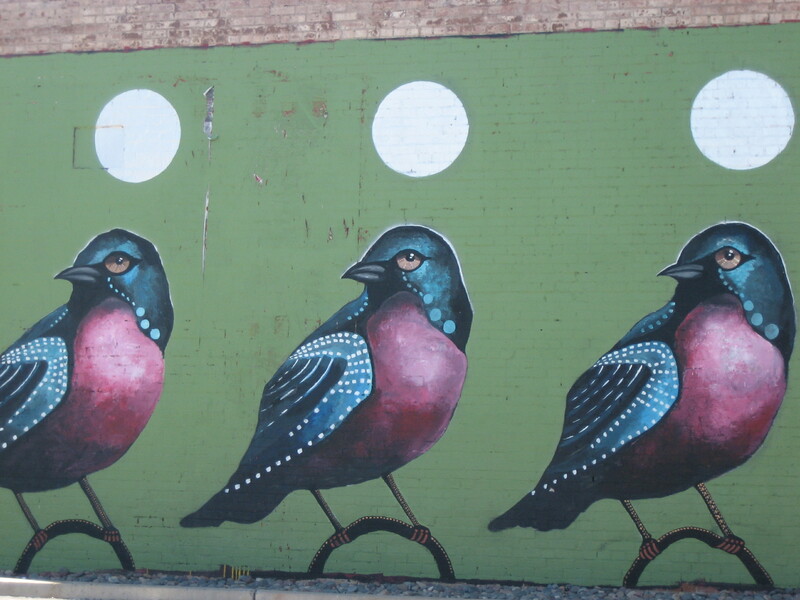 This mural was painted by Lauren Lee, and it’s called Three Birds. The building this mural is on is scheduled for demolition. 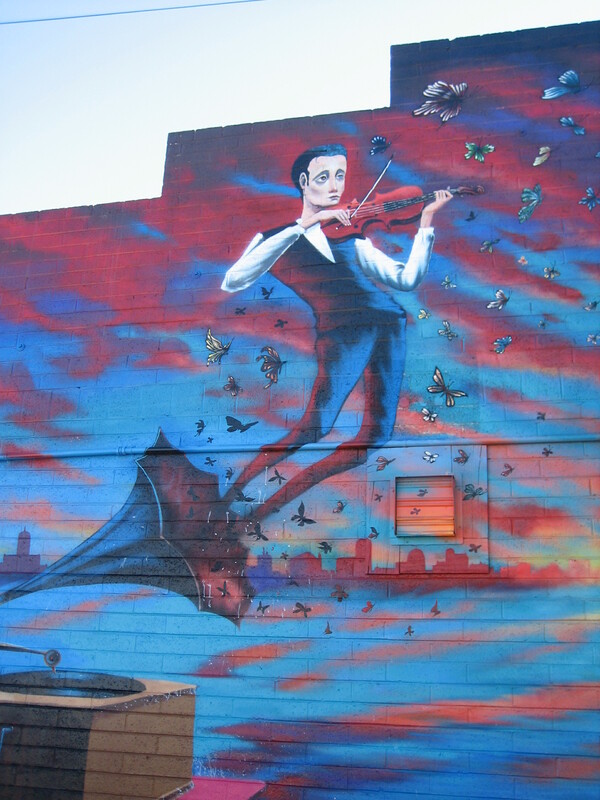 By the time you read this post, this mural will probably be forever gone.